I was invited to give the opening address at this year’s Martineau Society Conference (23-26 July, 2015), which took place in Norwich, the birthplace of both Harriet Martineau and Amelia Opie. My subject was ‘Amelia Opie and the Martineaus’. The Society was founded in Norwich in 1993 and has grown steadily since then, attracting member s from Europe, Scandinavia, Australia, Taiwan and Japan. In the early days interest focused primarily on Harriet Martineau (1802-1876), a distinguished writer and journalist, and her brother James (1805-1900), a philosopher and theologian. However, the Martineaus from whom Harriet and James were descended and the Martineaus who came after them are also worthy of attention. Many were not only important figures in the fields of medicine, art, engineering, linguistics and industry, but associates and friends of important people in the academic, political and economic circles of their day. 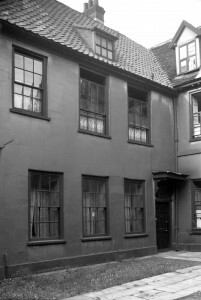 I had a particular interest in the birthplace of Harriet Martineau – Gurney Court in Magdalen Street – because the north wing of the house was let to my great-grandfather Walter Batterbee from 1896 to 1906. During research for my biography Amelia Opie: The Quaker Celebrity, I discovered that Amelia’s father Dr.James Alderson also had associations with Gurney Court, as he was the family doctor for the Gurneys who lived in the property in the 1770s and 1780s. I also discovered that Amelia Opie had associations with many of the Martineaus. The oldest was Sarah Martineau (1725-1800), Harriet’s grandmother, whose portrait was painted by Amelia’s husband, the Royal Academician John Opie. Amelia’s father and Harriet’s uncle Dr. Philip Meadows Martineau were colleagues at the Norfolk & Norwich Hospital which was founded in 1771 for ‘the deserving poor’. 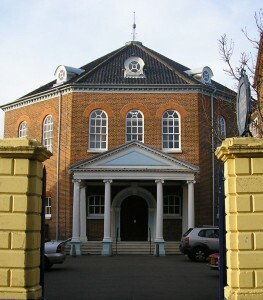 Amelia’s uncle Robert Alderson was for ten years a minister at the Octagon Chapel in Norwich, where both Amelia and Harriet were baptised. This was another connection for me – my maternal grandparents were married at the Octagon in 1905. In London in the 1780s Amelia was often a guest at the house of Dr. Robert Batty, whose daughter Elizabeth grew up to marry into the Martineau family and was the mother of the artist Robert Braithwaite Martineau. Members of the Martineau family subscribed to Amelia’s Memoir of her husband which was published in 1809 as a preface to his Lectures on Painting..
One of Amelia’s particular friends in the literary world, the essayist and poet Anna Letitia Barbauld, was also known to the Martineaus. In her autobiography, Harriet recalled her as a ‘comely elderly lady’ visiting the household when she was a child. As an adult she wrote admiringly of Mrs.Barbauld’s writings, but was less approving of others, criticising what she called the ‘literary pretensions’ of the city of her birth. 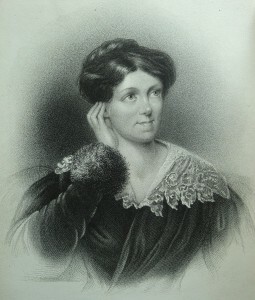 When Amelia Opie died in December 1853, Harriet wrote an obituary for the London Daily News, describing the death as ‘the loss of another of that curious class of English people – the provincial literary lion.’ Later the piece was included in Biographical Sketches, a collection of Martineau obituaries from the newspaper, published in 1869.